Neowin has an article up detailing some of the changes going into the RC of Windows 7 that have been made since the beta was released. This is just a small sampling, but Microsoft emphasized this was a result of user feedback during the beta process. 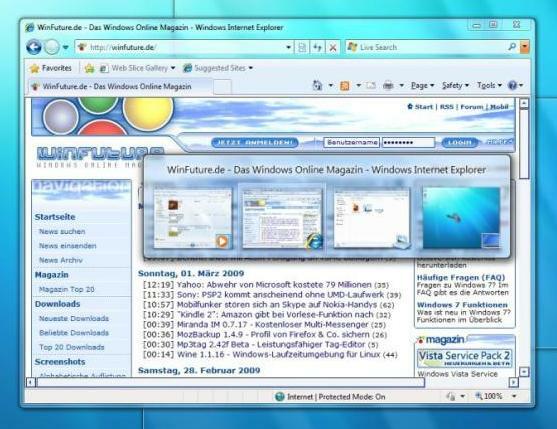 In the first few weeks of the Windows 7 beta we had over one million people install and use Windows 7. That's an astounding number for any beta test and while we know it has been fun for many folks, it has been a lot of work for us--but work that helps to raise the quality of Windows 7. When you use the beta you are automatically enrolled in our Customer Experience Improvement Program (anonymous feedback and telemetry, which is voluntary and opt-in in the RTM release). Just by using Windows 7 as a beta tester you are helping to improve the product--you are providing feedback that we are acting on in a systematic manner. Head over to Neowin to see more details of some of the changes in Windows 7. Well, I must say a lot of the changes are good. Windows 7 beats the heck out of Vista as far as ease of use. Microsoft must have listened to all the public complaints about Vista on this one. I am enjoying the beta and certainly will enjoy the final release. Microsoft always listens to their complaints. Vista was a necessary step towards a new kind of Windows though, it was guaranteed to have its share of pain. I was very glad to see them step away from their 'everything must work perfectly no matter how old it is and how broken the systems supporting it are' methods...bleh. Even though I agree it was mishandled, it was still necessary. Looks like a legitimate and sincere effort this time around, and that lessons have been learnt. Discarding the fact you had "growing" pains with Vista, you still had an OS that had plenty of other issues. Windows 7 64-bit looks like the way to go. XP is aging and the 2gb limit will start to show very soon. Well, if older applications cease to work on their new operating system, I will not use it. Neither will many others. I do not use 16-bit applications anymore, however those 32-bit should. Even on the 64-bit variant of the system. I want most of the older games to be operational. As for the games, I wish DirectX 9 and older classes to be HW accelerated, not to be emulated as I have heard they are if you have DirectX 10. Why is it when something new comes along there are individuals who just have to say that (no matter what) if it doesn't support this or that I will not use it, nor will many others. You would thank my some of these remarks that MS is doing this just to upset them, and because their games or applications are old they should be still supported by any new Operating System. Things get old, and at some point they have to be either no longer supported, or just discarded. They are hardware accelerated, no problems with that. The answer to this question is quite simple. We all want new features too, however we want the old ones to be supported too. If no one does say it, the project managers may decide there is no need for funding the backward compatibility. And as for me I do not want to spend thousands of bucks to get the computer to the working state where it already was. The other reason may be it is nice to criticize someone. One feels better if he may show his superior intellect (over the one that does something other than chit-chating). Decide yourself to what category I belong to! The answer to this question is quite simple. We all want new features too, however we want the old ones to be supported too. If no one does say it, the project managers may decide there is no need for funding the backward compatibility. It's the 'backward compatibility' that has been the millstone around Microsoft's neck. 'backwards compatibility' is trend-speak for 'living in the past'.